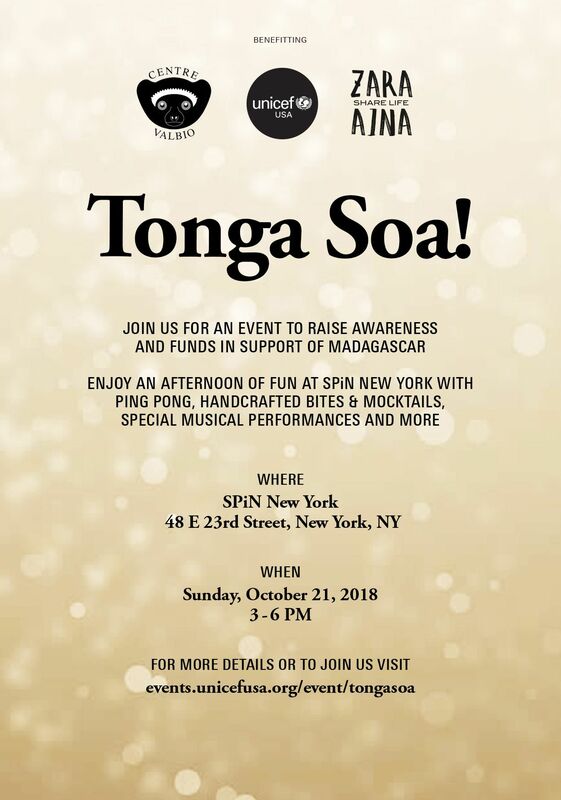 UNICEF USA - Tonga Soa! Access to SPiN New York's ping pong tables while snacking on handcrafted bites and custom created mocktails. The SPiN Experience: Play endless amounts of ping pong at their flagship location, SPiN New York. Centre ValBio works to protect Madagascar’s unique and biologically diverse ecosystems through conservation science and projects that directly benefit the local people, including rural health care delivery. CVB has a world-class research station sited on the edge of Madagascar's beautiful and abundant Ranomafana National Park. Under the direction of world-renowned primatologist Dr. Patricia Wright, Centre ValBio facilitates hands-on science to sustain the resources and people of Madagascar. In collaboration with villagers, we're expanding the frontiers of knowledge while safeguarding biodiversity for future generations. Zara Aina confronts the lack of educational opportunities facing Malagasy children by providing a year-round, holistic, child-centered learning model. We subsidize school tuition, meals, and medical and dental care, in an effort to knock down barriers to education and make way for scholastic, personal, and creative growth.